Securing an airway is a vital task for the anesthesiologist. The pediatric patients have significant anatomical and physiological differences compared with adults, which impact on the techniques and tools that the anesthesiologist might choose to provide safe and effective control of the airway. Furthermore, there are a number of pathological processes, typically seen in the pediatric population, which present unique anatomical or functional difficulties in airway management. 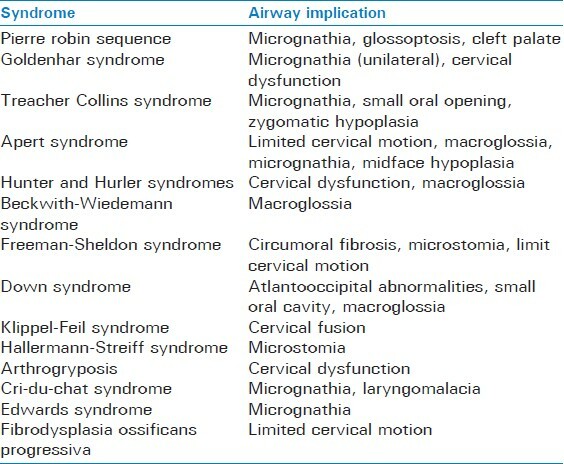 The presence of one of these syndromes or conditions can predict a "difficult airway." Many instruments and devices are currently available which have been designed to aid in airway management. Some of these have been adapted from adult designs, but in many cases require alterations in technique to account for the anatomical and physiological differences of the pediatric patient. This review focuses on assessment and management of pediatric airway and highlights the unique challenges encountered in children. One of the fundamental skills of an anesthesiologist is management of the airway. To be successful at this task, it is important for the provider to have knowledge of the important anatomical, physiological, and pathological features related to the airway as well as knowledge of the various tools and methods that have been developed for this purpose. In this vein most anesthetic providers are very familiar and skilled at managing the adult airway successfully. However, children are not merely small adults. There are important differences that occur during development that require a different approach or technique. Forewarned is forearmed. Therefore, this review article will highlight some of the important anatomical and physiological differences and their implication. It will then briefly describe some of the pathological conditions which present particular concern for airway management. Finally, an overview of techniques and tools for managing the pediatric airway will be discussed. The hypopharynx of the pediatric patient is relatively shorter in height and narrower in width. On cross section, the airway of an adult is more elliptical than that of the child. This has implication for supraglottic airway placement. The larynx is relatively higher in the neck in children. In some positions, the mandible may lie in line with the upper glottic structures. The cricoid ring is located approximately at the level of the C4 vertebrae at birth, C5 at age 6, and C6 as adult. Vocal cords are not typically found at a right angle (90°) to the trachea. They are angled in an anterior-inferior to posterior-superior fashion. While this typically does not affect laryngoscopic view, it can make insertion of the endotracheal tube more challenging or more traumatic. Especially in suboptimal views or with indirect video laryngoscopy, the endotracheal tube will have a higher tendency to collide with or become obstructed on the anterior commissure of the vocal folds. The epiglottis in children is more "U" shaped (compared to flat in adults) and it is less in line with the trachea and may lie across the glottic opening. This feature makes many anesthesiologists prefer semi-straight laryngoscope blades such as a Miller which are designed to directly lift the epiglottis out of view compared to a curved Macintosh blade which relies on ligamentous connection from the vallecula with the epiglottis to lift it out of view [Figure 2]. Based on cadaveric studies, it has been a commonly held belief that the pediatric airway is funnel-shaped with the narrowest portion of the airway being found at the level of the cricoid. This was contrasted to the adult airway, where the narrowest portion is the glottis and the airway is described as cylindrical. These refer to the more rigid structures of the larynx as outlined by the laryngeal and tracheal cartilages. Recent in vivo measurements taking into account the functional location of the softer tissues, specifically the vocal folds present a somewhat different picture. Measurements of the size of the airway of children using bronchoscopic images as well as magnetic resonance imaging images were consistently found to have glottic openings smaller than at the cricoid. ,, However, the distensibilty of the glottic tissues and the relatively nondistensible cricoid cartilage may still lead to the effect of the cricoid being functionally the narrowest part of the airway. This cartilaginous ring is the only circumferential complete structure in the airway and an endotracheal tube that passes easily though the vocal cords may not pass through the cricoid ring. The cricoid ring in an infant is elliptical, not circular, being oflarger diameter in the Antero-posterior dimension. This affects the seal of cuffed and uncuffed endotracheal tubes and may guide selection of tracheal tubes. The resistance to flow in the airway is governed by Poiseulle's law: R =8ƞL/πr 4 . The resistance to flow is inversely related to the radius of the airway raised to the fourth power, a small amount of narrowing (due to edema, inflammation, etc.,) in the already small pediatric airway could have severe consequences on respiratory function. A number of disease processes that could result in such narrowing of the airway include growths within the airway such as hemangiomas or papillomas, aberrant embryological development such as tracheomalacia, laryngomalacia, and laryngeal clefts, iatrogenic causes like vocal cord paralysis and subglottic stenosis, or compression of the airway structures by a mass located outside the airway. The management of these processes is unique to the disease itself but common themes exist, such as the desire to avoid further trauma to the tissues of the airway in order to avoid edema and further narrowing of the already compromised airway. Airway management is a key skill for the anesthesiologist. The airway of the pediatric patient has a number of significant differences when compared to the adult airway and presents some unique challenges. Awareness of anatomical and physiological differences, important pathological conditions affecting children, and a knowledge of the available airway techniques and tools will allow the anesthesiologist to formulate and execute safe and effective management of the pediatric airway. 1. Heinrich S, Birkholz T, Ihmsen H, Irouschek A, Ackermann A, Schmidt J. Incidence and predictors of difficult laryngoscopy in 11,219 pediatric anesthesia procedures. Paediatr Anaesth 2012;22:729-36. 2. Carr RJ, Beebe DS, Belani KG. The difficult pediatric airway. Sem Anesth Perioper Med Pain 2001;20:219-27. 3. Sunder RA, Haile DT, Farrell PT, Sharma A. Pediatric airway management: Current practices and future directions. Paediatr Anaesth 2012;22:1008-15. 4. Litman RS, McDonough JM, Marcus CL, Schwartz AR, Ward DS. Upper airway collapsibility in anesthetized children. Anesth Analg 2006;102:750-4. 5. Abramson Z, Susarla S, Troulis M, Kaban L. Age-related changes of the upper airway assessed by 3-dimensional computed tomography. J Craniofac Surg 2009;20 Suppl 1:657-63. 6. Adewale L. Anatomy and assessment of the pediatric airway. Paediatr Anaesth 2009;19 Suppl 1:1-8. 7. Hudgins PA, Siegel J, Jacobs I, Abramowsky CR. The normal pediatric larynx on CT and MR. AJNR Am J Neuroradiol 1997;18:239-45. 8. Mortensen A, Lenz K, Abildstrøm H, Lauritsen TL. Anesthetizing the obese child. Paediatr Anaesth 2011;21:623-9. 9. Dalal PG, Murray D, Feng A, Molter D, McAllister J. Upper airway dimensions in children using rigid video-bronchoscopy and a computer software: Description of a measurement technique. Paediatr Anaesth 2008;18:645-53. 10. Dalal PG, Murray D, Messner AH, Feng A, McAllister J, Molter D. Pediatric laryngeal dimensions: An age-based analysis. Anesth Analg 2009;108:1475-9. 11. Litman RS, Weissend EE, Shibata D, Westesson PL. Developmental changes of laryngeal dimensions in unparalyzed, sedated children. Anesthesiology 2003;98:41-5. 12. Sims C, von Ungern-Sternberg BS. The normal and the challenging pediatric airway. Paediatr Anaesth 2012;22:521-6. 13. Brambrink AM, Braun U. Airway management in infants and children. Best Pract Res Clin Anaesthesiol 2005;19:675-97. 14. Bruce IA, Rothera MP. Upper airway obstruction in children. Paediatr Anaesth 2009;19 Suppl 1:88-99. 15. Nargozian C. The airway in patients with craniofacial abnormalities. Paediatr Anaesth 2004;14:53-9. 16. Frei FJ, Ummenhofer W. Difficult intubation in paediatrics. Paediatr Anaesth 1996;6:251-63. 17. Mirghassemi A, Soltani AE, Abtahi M. Evaluation of laryngoscopic views and related influencing factors in a pediatric population. Paediatr Anaesth 2011;21:663-7. 18. Uezono S, Holzman RS, Goto T, Nakata Y, Nagata S, Morita S. Prediction of difficult airway in school-aged patients with microtia. Paediatr Anaesth 2001;11:409-13. 19. Meier S, Geiduschek J, Paganoni R, Fuehrmeyer F, Reber A. The effect of chin lift, jaw thrust, and continuous positive airway pressure on the size of the glottic opening and on stridor score in anesthetized, spontaneously breathing children. Anesth Analg 2002;94:494-9. 20. 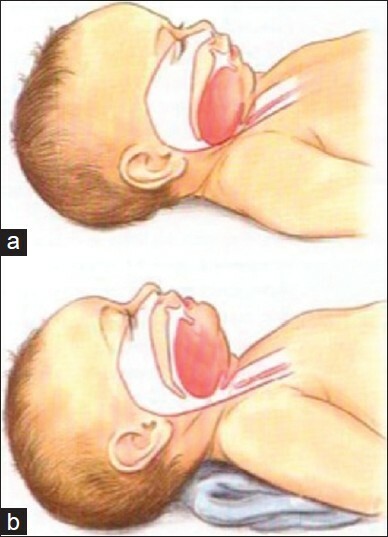 Arai YC, Fukunaga K, Hirota S, Fujimoto S. The effects of chin lift and jaw thrust while in the lateral position on stridor score in anesthetized children with adenotonsillar hypertrophy. Anesth Analg 2004;99:1638-41. 21. Holm-Knudsen R, Eriksen K, Rasmussen LS. Using a nasopharyngeal airway during fiberoptic intubation in small children with a difficult airway. Paediatr Anaesth 2005;15:839-45. 22. White MC, Cook TM, Stoddart PA. A critique of elective pediatric supraglottic airway devices. Paediatr Anaesth 2009;19 Suppl 1:55-65. 23. Mason DG, Bingham RM. The laryngeal mask airway in children. Anaesthesia 1990;45:760-3. 24. Lopez-Gil M, Brimacombe J, Alvarez M. Safety and efficacy of the laryngeal mask airway. A prospective survey of 1400 children. Anaesthesia 1996;51:969-72. 25. Sinha A, Sharma B, Sood J. ProSeal as an alternative to endotracheal intubation in pediatric laparoscopy. Paediatr Anaesth 2007;17:327-32. 26. Tait AR, Pandit UA, Voepel-Lewis T, Munro HM, Malviya S. Use of the laryngeal mask airway in children with upper respiratory tract infections: A comparison with endotracheal intubation. Anesth Analg 1998;86:706-11. 27. von Ungern-Sternberg BS, Boda K, Schwab C, Sims C, Johnson C, Habre W. Laryngeal mask airway is associated with an increased incidence of adverse respiratory events in children with recent upper respiratory tract infections. Anesthesiology 2007;107:714-9. 28. Ong M, Chambers NA, Hullet B, Erb TO, von Ungern-Sternberg BS. Laryngeal mask airway and tracheal tube cuff pressures in children: Are clinical endpoints valuable for guiding inflation? Anaesthesia 2008;63:738-44. 29. Scott J, Baker PA. How did the Macintosh laryngoscope become so popular? Paediatr Anaesth 2009;19 Suppl 1:24-9. 30. Doherty JS, Froom SR, Gildersleve CD. Pediatric laryngoscopes and intubation aids old and new. Paediatr Anaesth 2009;19 Suppl 1:30-7. 31. von Ungern-Sternberg BS, Boda K, Chambers NA, Rebmann C, Johnson C, Sly PD, et al. Risk assessment for respiratory complications in paediatric anaesthesia: A prospective cohort study. Lancet 2010;376:773-83. 32. Nandi PR, Charlesworth CH, Taylor SJ, Nunn JF, Doré CJ. Effect of general anaesthesia on the pharynx. Br J Anaesth 1991;66:157-62. 33. Curtis R, Lomax S, Patel B. Use of sugammadex in a ′can′t intubate, can′t ventilate′ situation. Br J Anaesth 2012;108:612-4. 34. Brooks P, Ree R, Rosen D, Ansermino M. Canadian pediatric anesthesiologists prefer inhalational anesthesia to manage difficult airways. Can J Anaesth 2005;52:285-90. 35. Thomas PB, Parry MG. The difficult paediatric airway: A new method of intubation using the laryngeal mask airway, Cook airway exchange catheter and tracheal intubation fibrescope. Paediatr Anaesth 2001;11:618-21. 36. Walker RW. The laryngeal mask airway in the difficult paediatric airway: An assessment of positioning and use in fibreoptic intubation. Paediatr Anaesth 2000;10:53-8. 37. Sinha R, Chandralekha, Ray BR. Evaluation of air-Q intubating laryngeal airway as a conduit for tracheal intubation in infants-a pilot study. Paediatr Anaesth 2012;22:156-60. 38. Barch B, Rastatter J, Jagannathan N. Difficult pediatric airway management using the intubating laryngeal airway. Int J Pediatr Otorhinolaryngol 2012;76:1579-82. 39. Nagler J, Bachur RG. Advanced airway management. Curr Opin Pediatr 2009;21:299-305. 40. Weiss M, Engelhardt T. Proposal for the management of the unexpected difficult pediatric airway. Paediatr Anaesth 2010;20:454-64. 41. Navsa N, Tossel G, Boon JM. Dimensions of the neonatal cricothyroid membrane-how feasible is a surgical cricothyroidotomy? Paediatr Anaesth 2005;15:402-6. 42. Coté CJ, Hartnick CJ. Pediatric transtracheal and cricothyrotomy airway devices for emergency use: Which are appropriate for infants and children? Paediatr Anaesth 2009;19 Suppl 1:66-76. 17 Paediatric supraglottic airway devices update?